This New York Times piece is representative of a set of views on the federal deficit, and is certainly consistent with Krugman's Friday NYT column on fiscal policy in the UK. THE clamor to cut the budget deficit is deafening. Blue Dog Democrats, Tea Party Republicans and doomsday economists are calling for immediate action. 2. We need to reduce the deficit "when the economy is back to normal," but "now is not the time." Tax cuts and spending increases stimulate demand and raise output and employment; tax increases and spending cuts have the opposite effect. This is a basic message of macroeconomics and a central feature of public- and private-sector forecasting models. 4. Part of the reason for waiting for the economy to be "back to normal," has to do with what (according to Romer) monetary policy should be doing when the deficit-reduction actually occurs. But once the economy has substantially recovered, the Federal Reserve will be ready to raise interest rates. At that point, the Fed could help maintain growth by instead continuing very low rates as the deficit is reduced. First, there may be some noise about deficit-cutting from the people Romer mentions, but I have not seen any serious and specific suggestions for deficit-cutting. This certainly doesn't get down to business. 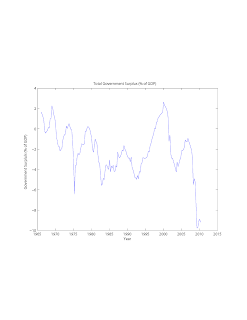 The proposed UK budget that Krugman hates so much is a program to reduce the UK budget deficit over a five-year period. You may not like what they are proposing, but Cameron's government has some courage that I don't see anywhere in US politics. It's clear in Romer's piece where she is coming from. She subscribes to plain-and-simple IS/LM aggregate-demand-management Old Keynesian macroeconomics. Old Keynesians appear to think that "demand deficiency" is self-evident given the currently-high unemployment rate. Unfortunately, it is hard to find the sources of our current problems in sticky-price and sticky-wage mechanics. Do we have a large number of people searching for work because firms are refusing to drop wages or prices? I don't think so, and I would welcome specific evidence that this is what is going on. 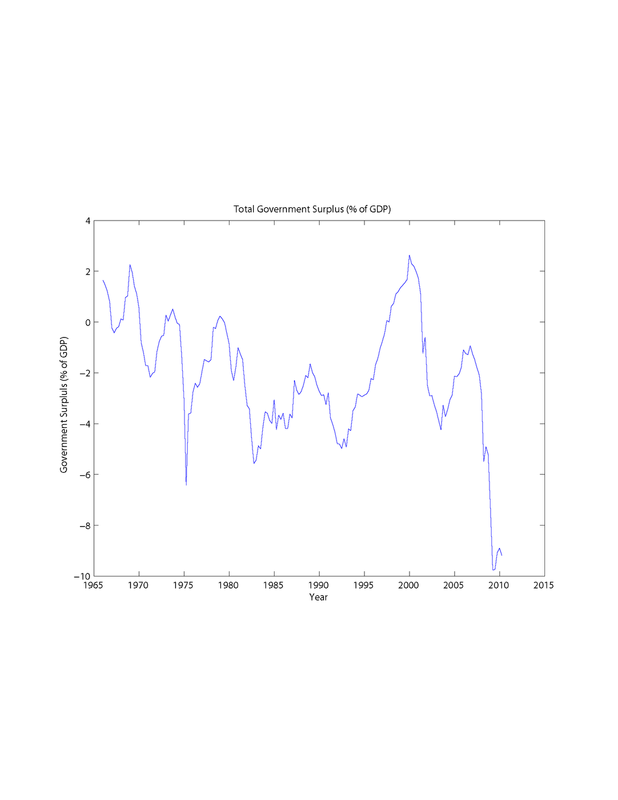 Now, Old Keynesians were never very specific about the timing of deficits and surpluses. In the IS/LM model, there is no future, no sovereign default, and no intertemporal government budget constraint. When do we stop worrying about the output gap and start worrying about the burden of the government debt and the possibility of sovereign default? An IS/LM model certainly isn't going to tell us. Let's review where we are currently on the fiscal side. These two charts show the federal government's debt, and the total (federal, state, local) budget surplus, in both cases as percentages of GDP. 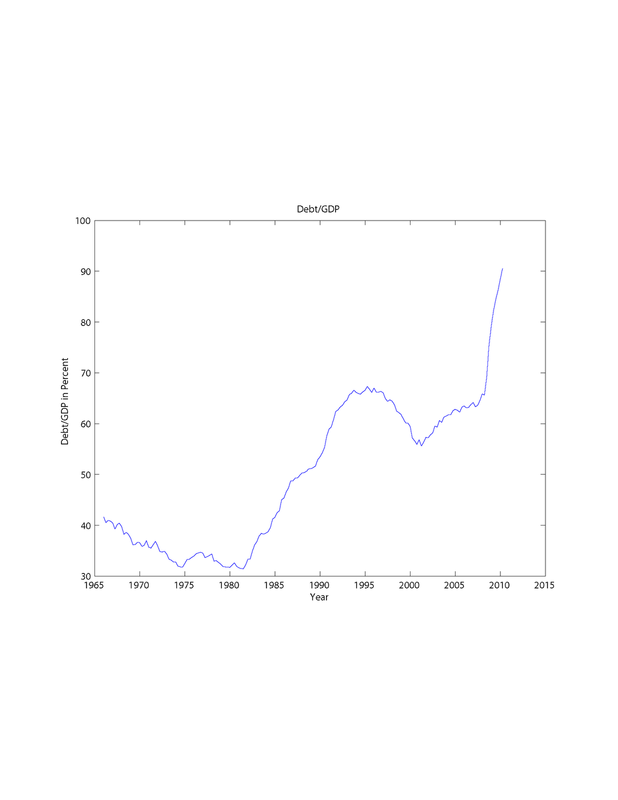 From the early 1980s, federal government debt has climbed from just over 30% of GDP to 90% of GDP, and the total government budget deficit exceeds 9% of GDP. 1. The Fed tightens. By the time this happens, the debt/GDP ratio will exceed 100%. Note that if all government debt were T-bills, and if the T-bill rate rose to 5%, then the cost, just of servicing the debt, then rises to 5% of GDP. Of course, US Treasury debt is not all T-bills, but the Fed's recent actions in particular have shortened the average maturity of debt in the hands of the public, making debt service more sensitive to short-term interest rates. As the Fed tightens, therefore, the deficit increases, and the federal debt mounts, increasing the pressure to do something about the deficit. The question is, at what point do our creditors become concerned about our ability to pay off our debt? Of course, this depends on whether our government shows any signs of coming to grips with its deficit. 2. The Fed does not tighten. Indeed, this is exactly what Romer is suggesting. In her view, the deficit needs to be cut eventually, but she thinks that will reduce aggregate demand, and she also thinks the Fed will come to the rescue and keep nominal interest rates low. She does not even consider the possibility that the Fed might have high inflation to worry about at the time. 3. The federal government takes the responsible route. It starts today, and works out a multi-year plan for deficit reduction. If #3 happens after the mid-term elections, I will eat my hat (I don't actually have a hat, but will eat someone else's if you want). There cannot be reductions in spending without serious reductions in entitlements, which no one has the stomach for, so there is no option but tax increases, and apparently no one has the stomach for that either. This is going to be interesting, but it will not be a pretty sight. I think the most likely option is #2. Bernanke and company do not, I think, have the courage that Paul Volcker had. Whether the federal government is in deficit-reduction mode or not, faced with high inflation, and with the recent recession in the rear-view mirror, Old Keynesian views on the FOMC will prevail. The result will be that we implicitly default on our national debt. The up side of this is that some people will no longer be lying awake at night worrying about how we might end up looking like Japan. However, some others might be concerned that we end up looking like Argentina. You forget, President Obama already signed the government's multi-year deficit reduction plan: the health reform bill. The Fed had an implicit inflation target of (say, approx) 2.5%. Inflation above 2.5% amounts to a de facto partial default. But inflation below 2.5% amounts to a ..... we don't even have a word for it....sort of a negative default... let's call it an "over-payment". Getting the CPI back up to its implicit target level path doesn't mean default. It means an elimination of the negative default, or over-payment. I'm assuming that getting up to 2% or so is going to be no problem. What I'm worried about is the possibility of inflation rates in the 5%-10% range. Hang on, I thought that 5-10% inflation meant we were Zimbabwe, not Argentina. Steve: OK. Makes sense. Funny thing is though, a lot of economists are saying it only has a slim chance of getting inflation to 2%! 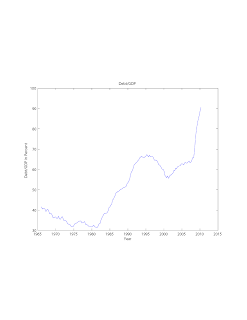 I've read that Professor Romer's economic foundation for her critiques/analysis are based on historical econometric analysis of the Great Depression. My question is, why hasn't the Lucas critique been more effective in infiltrating this sort of research and its relevance to today? Also, what is your opinion of Macroeconometrics in general? Thanks. I don't think anyone really knows. We're in uncharted territory here. I'm looking at the growth in currency outstanding and the exchange rate going south, and thinking 2% isn't far off.